A bank serves the main purpose of acting as a payment system, and as a financial intermediary. The banking system helps the flow of capital from those who have excess of it to those who need it. The depositors at the banks keep their excess money and the banks use these funds to finance various organizations, individuals and other who need money. A bank has a very important social role to play. The careful maintenance of the deposits kept at a bank is a matter of trustworthiness for the bankers. This is why the banking sector is always under supervision. The investments that a bank makes with the help of deposits have to be economically sound, because the default on that advance would make it difficult for the bank to return the deposit amount to the depositor. The monitoring authority, in our country, Bangladesh Bank, keeps a constant vigil to make sure that these depositors get their money back. All banks try to promote their deposit and loan products in the market. The vision of every bank is to be the most efficient bank in terms of customer service, profitability and technology application. The mission is continuous improvement in business policies and procedures, cost reduction through integration of technology at all level. The efforts on delivery service in all areas of banking activities with the aim to add increased value to shareholders investments and offer highest possible benefits to the customers. We try to present an overview of NCC Bank Limited and its financial products, a comparative analysis of NCC Bank Limited Consumer Credit Schemes with other commercial banks and some suggestion for the improvement of NCC Bank Limited throughout the report. The required data about the interview procedure are collected from face to face conversation with the manager and employee of NCC Bank Limited. To study existing banker-customer relationship, particularly the efficacy of customer services of the bank. Shown the profitable sector in which the bank achieved high return after investing. Identified the weak sector in which the bank has some bad experience in past. The report was fully exploratory in nature. Data have been collected from both primary & secondary sources. Annual report (2009) of NCC Bank Ltd.
Websites and News papers are was major sources. Some of my course element as related to this report. NCC Bank Limited is a new generation bank. It is a scheduled bank under private sector established under ambit of Bank Company Act, 1991 and incorporated as Public Limited company act, 1994 on 17th May 1993.Prior to conversion into a scheduled commercial bank; National Credit Limited (NCL) was incorporated as public limited investment company in Bangladesh on 18th November 1985. It made its journey with a modest beginning on 25th November 1985 at its registered office and first branch at 7-8 Motijheel Commercial Area, Dhaka-1000. The initial Authorized Capital of the company was 30 (Thirty) crore consisting of 30 (Thirty) lac. Ordinary share of Tk. 100/- each. A new opportunity in this field of financial activities was opened for the business. NCL made a careful journey and maintained its successive growth for few years with its qualified professional management under most unpredictable, unregulated, uncertainties and limitations. The emergence of NCC Bank Limited at the Juncture of liberalization of global economic activities, after the URUGUAY round has been an important event in the financial sector of Bangladesh. The experience of the prosperous force and the strategic operational policy option of the bank. The company philosophy, “A Bank with vision” has been precisely the essence of the legend of Bank’s success. Like clothes shops, candy shops, bake shops, food shops, NCCBL is not a “debt shop” the term being used by many to call the present say banks. It is now been called a modern bank that undertakes all its operation at international standard. Having standard its operation as a commercial bank in 1993, recording from some primary difficulties, NCC bank has now emerged as a major player in the financial sector. Listed in both Dhaka and Chittagong bourses since late 1999 with an IPO that raised the paid-up capital of the bank to Tk. 39 crore. Banks are the pillars of the financial system. Specially, in Bangladesh, the health of the banking system is very vital because the capital market is little developed here. As the banks are still the major sources of credit and exercise great influence on the financial system, it is extremely important that the country’s banking systems should be in good health in the interest of investment activities, meeting the needs of all kinds of finance and related matters. Over the years, NCC bank has built itself as one of the pillars of Bangladesh’s financial sector and is playing a pivotal role in the extending the role of the private sector of the economy. The bank has a strong branch network nation wide with 67 branches. Anticipating business solutions required by all our customers everywhere and innovative supplying them beyond expectation. Setting industry benchmarks of world class standard delivering customer value through our comprehensive product range, customer service and all our activities building an exciting team-based working environment that will attract, develop and retain employees of exceptional ability who help celebrate the success of our business, of our customer and of national development. Continuously improving productivity and profitability, and thereby enhancing shareholder value. To be in the front of national development by providing all the customers inspirational strength, dependable support and the most comprehensive range of business solution through our team of professional that work passionately to be outstanding in everything we do. National Commerce and Credit Bank Limited emerged as bank in the country on 17th May 1993 out of a great turbulent situation encounter by set while National Credit Limited. However the institution survived the ordeals and come out as a full-fledged commercial bank. The company raised its Authorized Capital to Tk. 750 million as per guidelines set out by the Bangladesh Bank. The paid up capital was fixed at Tk. 480.48 million as against Tk. 429.00 million. Successful companies today are fully aware that they need to be able to rely on the services of a bank that can handle international trade with a good hand. 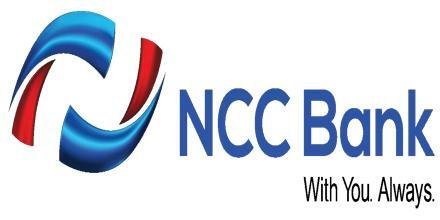 Ever since its conversion into a full –fledged bank in 1993, NCC bank has been an accomplished “Trade Finance” bank. With a highly professional team experienced and competent professionals we are able to provide a wide range of services to companies engaged in international trade. NCC Bank has also positioned itself as an established correspondent bank. Through a worldwide network of 260 correspondent banks NCC Bank is present in all key areas of the globe. Our ambit of correspondent includes top ranking international banks with a global reach. NCCBL has 67 (Sixty seven) branches all over in Bangladesh. The name of the branch, their addresses are given in the appendix-1. The bank may sustain its strong image in the mind of the customers and shareholders as a leading financial institution despite serious competition from both local and foreign banks operating in the country. Sill they are increasing their profit. Its opening profit was Tk. 624.94 million in 2007, which were Tk. 597.57 million in previous year. But whole performance of the bank is not looking well. The authorize capital of the bank remain unchanged at Tk. 750 million in the year 2008. The bank raises its paid-up capital from Tk. 480.48 million to Tk. 552.55 million for 2008 to 2009. With the increase of paid-up capital to Tk. 552.55 million, the capital based of the bank has become strong. The reserve fund of the bank increased of Tk. 336.12 million in the year 2008 as against Tk. 336.12 million of previous year, increase being 24.85%. To provide excellent quality Customer service. To become a trusted repository of customers’ money and their financial advisor. To make our stock superior and rewarding to the customers/share holders. This bank is one of the most disciplined Banks with a distinctive corporate culture. Here we believe in shared meaning, shared understanding and shared sense making. They mould their manners and etiquette, character individually to suit the purpose of the Bank and the needs of the customers who are of paramount importance to us. The people in the Bank see themselves as a tight knit team/family that believes in working together for growth. The corporate culture we belong has not been imposed; it has rather been achieved through our corporate conduct. NCC BANK Limited has already established a favorable reputation in the banking industry of the country. It is one of the leading private sector commercial banks in Bangladesh. The bank has already shown a tremendous growth in the profits and deposits sector. NCC BANK Limited has already achieved a high growth rate accompanied by an impressive profit growth rate in 2001. The number of deposits and the loans and advances are also increasing rapidly. NCC BANK has an interactive corporate culture. The working environment is very friendly, interactive and informal. And, there are no hidden barriers or boundaries while communicate between the superior and the employees. This corporate culture provides as a great motivation factor among the employees. NCC BANK has the reputation of being the provider of good quality services too its, potential customers. Not proper utilization of the banking system. The bank failed to provide a strong quality-recruitment policy in the lower and some mid level position. As a result the services of the bank seem to be Deus in the present days. The poor service quality has become a major problem for the bank. The quality of the service at NCC BANK is higher than the Dhaka Bank or Dutch Bangla Bank etc. But the bank has to compete with the Multinational Bank located here. Some of the job in NCC BANK has no growth or advancement path. So lack of motivation exists in persons filling those positions. This is a weakness of NCC BANK that it is having a group of unsatisfied employees. In terms of promotional sector, NCC BANK has to more emphasize on that. They have to follow aggressive marketing campaign. In order to reduce the business risk, NCC BANK has to expand their business portfolio. The management can consider options of starting merchant banking or diversify into leasing and insurance sector. Opportunity in retail banking lies in the fact that the country’s increased population is gradually learning to adopt consumer finance. The bulk of our population is middle class. Different types of retail lending products have great appeal to this class. So a wide variety of retail lending products has a very large and easily pregnable market. A large number of private banks coming into the market in the recent time. In this competitive environment NCC BANK must expand its product line to enhance its sustainable competitive advantage. In that product line, they can introduce the ATM to compete with the local and the foreign bank. All sustaining multinational banks and upcoming foreign and private banks pose significant threats to NCC BANK Limited. If that happens the intensity of competition will rise further and banks will have to develop strategies to compete against these local and foreign banks. The default risks of all term loans have to be minimized in order to sustain in the financial market. Because of default risk the organization may become bankrupt. NCC BANK has to remain vigilant about this problem so that proactive strategies are taken to minimize this problem if not eliminate. The low compensation package of the employees from mid level to lower level position is not able to keep the employee motivation. As a result, good quality employees leave the organization and it effects the organization as a whole. Normally various big companies, organizations, Government Departments keep money in STD account. Frequent withdrawal is discouraged and requires prior notice. The deposit should be kept for at least seven days to get interest. The interest offered for STD is less than that of savings deposit. Interest is calculated based on daily minimum product and paid two times in a year. Interest rate is 6.00%. Permission letter from Bureau of N.G.O. (In case of N.G.O. A/C). If the NCC BANK finds that the account is inoperative for a long duration. If the court of NCC BANK issues garnishee order. A customer may close his/her account any time by submitting an application to the branch. The customer should be asked to draw the final check for the amount standing to the credit of his/her account less the amount of closing an other incidental charge and surrender the unused check leaves. The account should be debited for the account closing charge etc. and the authorized officer of the bank should destroy unused check. In case of joint account the application for closing the account should be signed by the joint account holder. The fee for closing of an account is Tk.50. In these purpose the three officer of this bank to help me. They are Mr. Humaun Kabir, Ms. Syeda Taslima Begum and Special thanks Ms. Syeda Shammi Akter. Explanation Pay Order gives the payee the right to claim payment from the issuing bank Demand Draft is an order of issuing bank on another branch of the same bank to pay specified sum of money to payee on demand. Generally used to Remit fund Within the clearinghouse area of issuing branch. Outside the clearinghouse area of issuing branch. Payee can also be the purchaser. Test key arrangement is a secret code maintained by the banks for the authentication for their telex messages. It is a systematic procedure by which a test number is and the person to whom this number is given can easily authenticate the same test number by maintaining that same procedure. NCC BANK has test key arrangement with so many banks for the authentication of LC message and for making payment. The Local Remittance section of NCC BANK Motijheel Branch also issues TDR. They are also known as time deposit or time liabilities. These are deposits, which are made with the bank for a fixed period, specified in advance. The bank need not maintain cash reserves against these deposits and therefore, the bank offers higher of interest on such deposits. Opening of TDR Account: The depositor has to fill an account form where in the mentions the amount of deposit, the period for which deposit is to be made and name/names is which the TDR term deposit is to be issued. In case of a Joint name NCC BANK also takes the instructions regarding payment of money on maturity of the deposit. The banker also takes specimen signatures of the depositors. A TDR term deposit account is then issued to the depositor acknowledging receipt of the sum of money mentioned there. It also contains the rate of interest and the date on which the deposit will fall due for payment. Term Deposits: These rates are not negotiable. In this table we can find out the percentage that is given by the bank for specific period of time to the customer. Payment of interest: It is usually paid on maturity of the fixed deposit. NCC BANK calculates interest at each maturity date and provision is made on that “miscellaneous creditor expenditure payable accounts” is debited for the accrued interest. Encashment of FDR: In case of premature FDR< NCC BANK is not bound to accept surrender of the deposit before its maturity date. In order to deter such a tendency the interest on such a fixed deposit is made cut a certain percentage less the agreed rate. Normally savings bank deposit is allowed. Loss of FDR: In case of lost of FDR the customer is asked to record a GD (general diary) in the nearest police station. After that the customer has to furnish an Indemnity Bond to NCC BANK a duplicate FDR is then issued to the customer by the bank. Renewal of FDR: In NCC BANK, the instrument is automatically renewed within seven days after the date of its maturity if the customer does not come to encash the FDR. The period for renewal is determined as the previous one. The amount of Cheques, Pay Order (P.O), and Demand Draft (D.D) Collection from other banks on behalf of its customer is a basic function of a Clearing Department. Clearing House: Clearing House is a place where the representatives of different banks get together to receive and deliver Cheques with another banks. Normally, Bangladesh Bank performs the Clearing House in Dhaka, Chittagong, Rajshahi, Khulna & Bogra. Where there is no branch of Bangladesh Bank, Sonali bank arranges this function. Member of Clearing House: NCC BANK limited is a scheduled Bank. According to the Article 37(2) of Bangladesh Bank Order, 1972, the banks which are the member of the clearinghouse are called as Scheduled Banks. The scheduled banks clear the cheque drawn upon one another through the clearinghouse. Outward Clearing: When the Branches of a Bank receive cheques from its customers drawn on the other Banks within the local clearing zone for collection through Clearing House, it is Outward Clearing. Inward Clearing: When the Banks receive cheque drawn on them from other Banks in the Clearing House, it is Inward Clearing. 2nd house: 2nd house normally stands after 3 p.m. and it is known as return house. 2nd house: 2nd house normally stands after 2 p.m. and it is known as return house. 3) Date in the cheque may be on or before (but not more than six months back) clearing house date. Return house: Return House means 2nd house where the representatives of the Bank meet after 3 p.m. to receive and deliver dishonored chouse which placed in the 1st Clearing House. Amount in figure and word differs. Cheque out of date/ post- dated. Payment stopped by the drawer. …Payee’s endorsement irregular / illegible / required. Drawer’s signature differs / required. Crossed cheque to be presented through a bank. Other specific reasons not mentioned above. The dishonor Cheques entry in the Return Register & the party is informed about its Party‘s signature required in the return register to deliver the dishonor cheque. After duration, the return cheque is sent to the party’s mailing address with Return Memo. If the cheque is dishonored due to insufficiency of funds then NCC BANK charges TK.25 as penalty. (Computer) posting of the cheque. Clearing seal & proper endorsement of the cheque. Separation of cheque from deposit slip. Sorting of cheque 1st bank wise and then on branch wise. Computer print 1st branch wise & then bank wise. Preparation of 1st Clearing House computer validation sheet. Copy of computer posting in the floppy disk. Bills Collection: In modern banking the mechanism has become complex as far as smooth transaction and safety is concerned. Customer does pay and receive bill from their counterpart as a result of transaction. Commercial bank’s duty is to collect bills on behalf of their customer. Entry in the OBC register. Put OBC number in the cheque. “Crossing seal” on the left corner of the cheque & “payees account” will be credited on realization “seal” on the back of the cheque with signature of the concerned officer. Despatch the OBC cheque with forwarding. Reserve the photocopy of the cheque, carbon copy of the forwarding and deposit slip of the cheque in the OBC file. General Banking activities are related with progression of operation. NCC’S operations are increasing gradually. Each year deposits growth indicates NCC`S better movement in the banking field which is satisfying clients. As a result, clients are increasing and ultimately equity is increasing. In 2009 Bank’s reserve capital was Tk.871.77 (Million) compared with Tk.598.39 (Million) in 2007. Gradually bank’s operations are increasing. Investment is increasing rapidly and a good response is getting from the clients in different investment scheme. NCC`S increasing movement is generating increasing profits. NCC is gaining huge profits by satisfying clients. Client’s satisfaction depends on the efficacy of customer service. All operational improvement with profit leads us to say that –efficacy of customer service of NCC BANK is in the positive situation. Bank should offer more facilities to the customers such as credit card visa card ATM machine etc. As soon as possible the bank should state more branches in Dhaka city as well as other cities of the country. Now a day’s world is going very fast. Now most of the banks open online customer service system. So in order to compete in the world marketing they should adopt online banking system in every branch. Data based networking is the most modern technology to transfer data form branch to branch or branch to head office and vice versa. From the practical implementation of customer dealing procedure during the whole period of my practical orientation in NCC BANK Limited I have reached a firm and concrete conclusion in a very confident way. I believe that my realization will be in harmony with most of the banking thinkers. It is quite evident that to build up an effective and efficient banking system to the highest desire level computerized transaction is a must. Success in the banking business largely depends on effective various accounts. The more income will be from reserve fund. And also the more income from Credit operations the more will be the profit of the NCC BANK Limited. Though there are some drawbacks in implementing Credit General banking in NCC BANK Limited as per manual, it can be further developed in light of the recommendations being discussed above. Finally it can be argued that though the results achieved so far are not satisfactory, General banking is much more important part for enhancing NCC Bank’s strength and there lies the opportunities to make it more effective in the future for our own benefit.